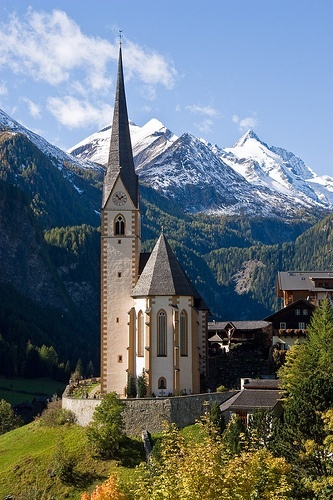 Heiligenblut (literally "holy blood") am Großglockner is a municipality in the district of Spittal an der Drau in the Austrian state of Carinthia. The municipal area comprises the Katastralgemeinden of Apriach, Hof, Rojach and Zlapp. Situated at the northwestern edge of Carinthia at the border with East Tyrol and Salzburg, Heiligenblut is located in a high valley of the Alpine Hohe Tauern mountain range at the foot of the Grossglockner, the highest mountain in Austria, and the Pasterze Glacier. Other peaks include the Johannisberg and the Fuscherkarkopf in the north, both part of the Alpine divide and the border with Salzburg. The municipality is also the southern starting point of the scenic Grossglockner High Alpine Road to Bruck in the state of Salzburg, the former Hochtor Pass, today the continuation of the B107 highway from Lienz in East Tyrol. Nearby attractions include the Heiligenblut-Roßbach-Schareck cable car up to 2,606 m (8,550 ft), an open-air museum, the Stockmühlen mills in Apriach with nine flume mills, Lake Kachelsee to the west, the Möll, Gößnitz and Leiter waterfalls, the Margaritzen reservoir, and Lake Sandersee.